Although it’s only been a little over 25 years since the fall of the Soviet Union, resulting in the mass exodus of Jews to Israel and elsewhere, for many this story of freedom might as well be ancient history. The courageous men and women in the former Soviet Union who risked everything to challenge a totalitarian government’s decision not to let them make Aliyah to Israel or rejoin their families are for the most part a faint memory to most American Jews today. I write this today because we lost one of the true heroes of modern Jewish history on Wednesday. Masha Slepak passed away at the age of 91 leaving a legacy she shared with her late husband Vladimir that few will ever match. Together with a small group of other Jewish activists they paved the way for so many other Soviet Jews to enjoy new found freedom in Israel and the West – something they themselves didn’t experience until 1987. The Slepaks took bold action when required, even if it meant incurring the wrath of the KGB. When Volodya was sent into internal exile in Siberia, with Masha repeatedly making the grueling journey to join him, their activism didn’t cease. Masha and Volodya set the standard for the Kosharovskys, Nudels and other refusenik leaders. Please take the time to read in this week’s update about Masha Slepak’s life and the moving tribute by Natan Sharansky to her. She will be remembered and honored for her contributions to the Jewish people. For those who are currently in Israel and would like to attend Masha's funeral, the burial is scheduled for 2 PM this Sunday, September 10th at Har HaMenuchot in Jerusalem. Click here to read yesterday's press release from NCSEJ regarding Masha's passing. 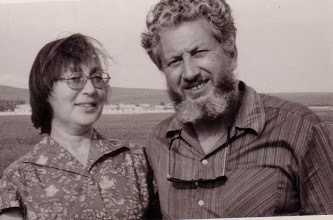 Masha and Volodya Slepak, 1979. Maria Slepak, a Prisoner of Zion and Soviet Jewry leader with her husband before they were finally allowed to immigrate to Israel, has died. Soviets Shut This Yeshivah 82 Years Ago. Now, It’s Reopening. Moscow’s suburb of Malakhovka was long known as a Jewish shtetl. The artist Marc Chagall once taught art there at a home for Jewish war orphans. Yiddish could be heard shouted in its marketplace as late even as the 1980s. Jews prayed in the town’s little wooden synagogue, from its construction in 1932, as Stalin’s terror began to gain steam, until its destruction in the 2000s. The synagogue (whose original sponsors were arrested and shot by authorities) was burnt to the ground by a local drug addict, but replaced by a brand-new building, Chabad-Lubavitch of Malakhovka, in 2010. Now a yeshivah has opened in the town. Or rather, reopened. Classes at Yeshivah Ketana of Malakhovka, geared to high-school-aged students, began on Aug. 30. The yeshivah is led by Atlanta native Rabbi Moshe Lerman and offers a personalized approach to students, who are mostly graduates of Jewish schools throughout Russia. Michal Zielinski, a 47-year-old from this city, grew up unaware of his Jewish roots. Thirty years after discovering that his paternal family is Jewish, following the death of his grandmother, Zielinski and his wife, Elizabeth are active members of the Jewish Community Center of Krakow, participating in programs with their 3 1/2-year-old daughter. Izabela Kardash, a Polish woman, and her Israeli husband, Avichay, are parents of two daughters — a 4-year-old who speaks Polish and Hebrew, and a 9-month-old. They are also active JCC members. If circumstances allowed, Izabela says she would relocate to Tel Aviv, a city she loves. Next week, as the school year starts in Krakow, the two families will be among the inaugural group of families at Frajda, the new child care center that will open Monday at the JCC of Krakow. Thirty Polish rescuers of Jews living in Warsaw during the Holocaust were honored by a foundation that assists righteous gentiles. The rescuers who met Sunday at the POLIN Museum of the History of Polish Jewry in Warsaw range in age from the late 80s to 101, according to the Jewish Foundation for the Righteous. Foreign diplomats, religious leaders and community leaders were on hand to recognize the heroism of rescuers deemed Righteous Among the Nations by the Yad Vashem Holocaust memorial in Jerusalem. For close to 30 years, leaders of Polish Jewry have been celebrating what they call the revival of their once-great community from near annihilation during the Holocaust. After years of heating up, the EU’s values crisis is close to boiling point. Defiance of core EU principles by the governments in Warsaw and Budapest is turning into a political crisis. The European Commission has taken legal action against both governments for violating specific EU laws and is threatening to go further on Poland. The European Parliament supports this course and is preparing further action against Hungary. But the Hungarian and Polish governments will feel the heat only if political leaders of the EU’s other member states get actively involved. The EU’s role in protecting values in its members’ domestic affairs has evolved significantly over the last two decades. Initially, European integration was primarily about economic cooperation. The creation of a community of law was fundamental to provide a high degree of certainty and stability to citizens and businesses, and it remains the EU’s great comparative advantage over rising powers and other investment destinations. The union’s legal framework proved remarkably resilient during recent crises over the euro and migration. But now its foundations are under attack from the inside. National political leaders must join the EU institutions in doing more to defend the union’s core values. Lithuania’s foreign minister on Monday called for stronger cooperation between Jerusalem and the European Union regarding Iran’s nuclear ambitions, saying his visit to Israel this week has opened his eyes about problematic aspects of the nuclear agreement the international community reached with Tehran in 2015. “I told [my Israeli interlocutors] that many think the Iranian deal is a way to mitigate the problem [of Iran’s nuclear ambitions] through engagement, but here I heard a lot of criticism of the Iranian deal. We need to put all the arguments on the table and to look at them very carefully. Otherwise it would be very difficult to find a common approach,” Linas Linkevičius told The Times of Israel. On September 1, the EU-Ukraine Association Agreement (AA) finally entered into force. The moment passed rather quickly, not least because parts of the AA had already been provisionally implemented—the political part since November 2014 and the Deep and Comprehensive Free Trade Area (DCFTA) since January 2016. This political fudge resulted from the Dutch referendum halting the ratification of the AA on the EU side as well as fruitless talks with Russia about the economic implications for the Russian market. The AA has been long in the making and its history has been more dramatic than any comparable EU agreement to date. Its official entry into force is therefore politically significant, even if the actual implementation and the resulting tangible benefits for Ukrainian citizens will take time. Ukraine is a territory saturated in Jewish memory – memory both tragic and sublime. In every field of endeavor – religious thought, Zionist and socialist politics, art, music, military affairs, science ? Jews from the territory on which the modern Ukrainian state is located have registered outstanding achievement. It is the birthplace of Rabbi Yisrael ben-Eliezer, the Baal Shem Tov, founder of Hasidic Judaism, who grew up near Kameniec in what is now western Ukraine; Rabbi Nachman of Bratslav, founder of the Breslov Hasidic movement, who was born in Miedzyboz in central Ukraine; Haim Nachman Bialik, the poet laureate of modern Hebrew literature, who was born in Zhitomir, in north central Ukraine. Goldie Meyerson, who became prime minister Golda Meir, was born in Kiev. Israeli-born Moshe Dayan, famed fighter and commander, was the son of Shmuel Dayan, who came from Zhashkiv, in the Cherkassy region, central Ukraine. Isaac Babel, one of the foremost Soviet novelists of the mid-20th century, whose “Red Cavalry Tales” remains a classic of 20th-century Russian literature, came from Odessa. Leon Trotsky, born Lev Bronstein, architect of the Russian revolution and founder of the Red Army, came from Yanovka, in the Kherson region of Ukraine. Vladimir Ze’ev Jabotinsky, father of Revisionist Zionism, came from Odessa. Solomon Rabinovitch, better known as Sholem Aleichem, came from Pereyaslav, in the Kiev governorate. And so on. The area has played host to an astonishing gathering of Jewish creative energies. NATO chief Jens Stoltenberg has said he sees no "imminent threat" from Russia's upcoming military maneuvers with Belarus, but criticized Moscow for not being more open about the drills. The Zapad (West) 2017 exercise, which Moscow says will involve some 12,700 troops, has caused concern in Poland and the Baltic states. Lithuania and Estonia say that as many as 100,000 soldiers could take part, though Russia insists the event is "purely defensive" in nature. NATO has deployed four battle groups -- around 4,000 troops -- to Estonia, Lithuania, Latvia, and Poland in recent years in response to growing Russian assertiveness in the region, particularly after it annexed Crimea from Ukraine in 2014. Ambassador John Tefft's comments in a joint interview with RFE/RL and VOA on September 6 came a day after Russian President Vladimir Putin denounced what he called "boorish and unprecedented" actions against the Russian Consulate in San Francisco and trade representations in Washington and New York. Russia has called the takeovers an "openly hostile act" and accused U.S. authorities of threatening to "break down the entrance door" of the Russian Consulate in San Francisco after Washington set a September 2 deadline for the premises to be clear. Trump ‘is not my bride’: Putin wades into diplomatic row with U.S.
“It is hard to conduct a dialogue with people who confuse Austria with Australia, but there is nothing we can do about this. It seems to be the level of political culture in a certain part of the U.S. establishment,” Putin said in his first public statements on the diplomatic dispute that has been deepening since Washington announced the closure of Russia’s consulate in San Francisco, as well as diplomatic properties housing trade missions in New York and Washington. The comments came during a news conference at an economic summit in the Chinese city of Xiamen. Putin repeated boilerplate language about how he and President Trump each defended their national interests, but he laced his remarks with bitter jokes. As Confederate statues come down in the U.S., Russia is resurrecting figures from its own thorny past. Soviet statues tumbled precipitously during the breakup of the U.S.S.R. But under Russian President Vladimir Putin and his project to restore Russia’s status as a great power, monuments to the country’s often painful Soviet and monarchic history have been rising again. On Tuesday, city leaders in Kirov, about 500 miles east of Moscow, unveiled a statue of Felix Dzerzhinsky, a Bolshevik revolutionary and the founder of the Cheka, the dreaded Soviet secret police, later known as the KGB. In Mr. Putin’s Russia, memory is selective. Backers see the statue as a tribute to a man who helped build a formidable intelligence service. But it has prompted anger among the descendants of those persecuted: Mr. Dzerzhinsky oversaw the Red Terror, the execution of hundreds of thousands of citizens during Russia’s 1917-1922 Civil War, often without trial.